There’s something weird going on down when the tide goes out… something luminescent and alive. 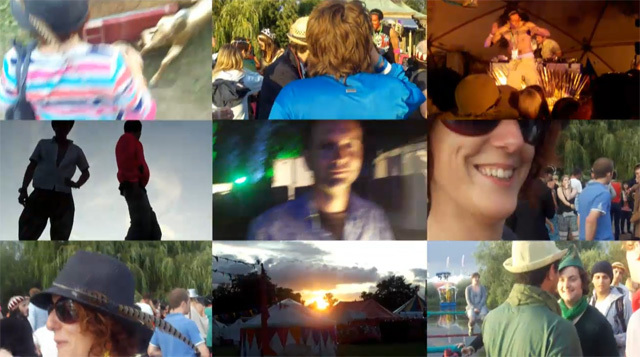 There’s a whole crawling, creeping ecosytem just below your feet at the river bank and it’s climbing steadily upwards…Look out..
Footage of The Secret Garden Party 2009, edited in a way to emulate the feeling of actually being there. For your enjoyment, some footage of Hyde Park, London, shot in September 2009. Welcome to the Venice Biennale – the greatest and largest contemporary art show in the world. Here for your entertainment and delectation are some selected photographs. It’s quite pretty London during the night time. I took some photos recently testing out the HDR possibilities of Photoshop and my camera. Pushing the curve, or pushing the “S” curve to give it it’s proper name is a colourist’s term for adjusting the gamma curve of an image to crush the blacks and roll off the highlights giving the image a more “filmic” look. Film has a particular performance characteristic when exposed to light which means it is much more sympathetic to extremes of contrast than video sensors which tend to blow out the highlights when confronted with extremes of brightness. We went to Brighton last summer. The first shock was that it was available in colour. The second was that it rocked. It’s been snowing in Ealing, We built a snowman and took some pictures..